From Brooks Beach, the bay just metres from Sanctuary, you can hop the rocks, south along the headland and emerge at Bingil Bay, the most densely forested town of the area. Here lives the smallest part of the Mission Beach community. The Clump Mountain National Park, Bicton Hill Walking Trail also begins here and emerges at the top of the hill to spectacular views of the coast. At the most southern township, you will find the end of the Beach Bus service and also the start of the stunning Kennedy Walking Trail, which explores beach and forest until the sandy stretch of paradise is finally interrupted by the Hull River. 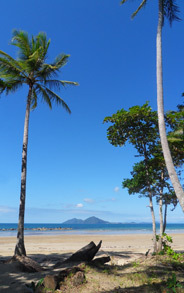 South Mission Beach is the closest land point to Dunk Island and is the departure point for the Coral Sea Kayaking adventures.